Casa Ybel Resort, a 23-acre full service resort off the coast of Southwest Florida’s Sanibel Island has promoted Lea O’Brien and Sean Ramsey to Event Coordinator and Restaurant Manager for its Thistle Lodge Beachfront Restaurant. 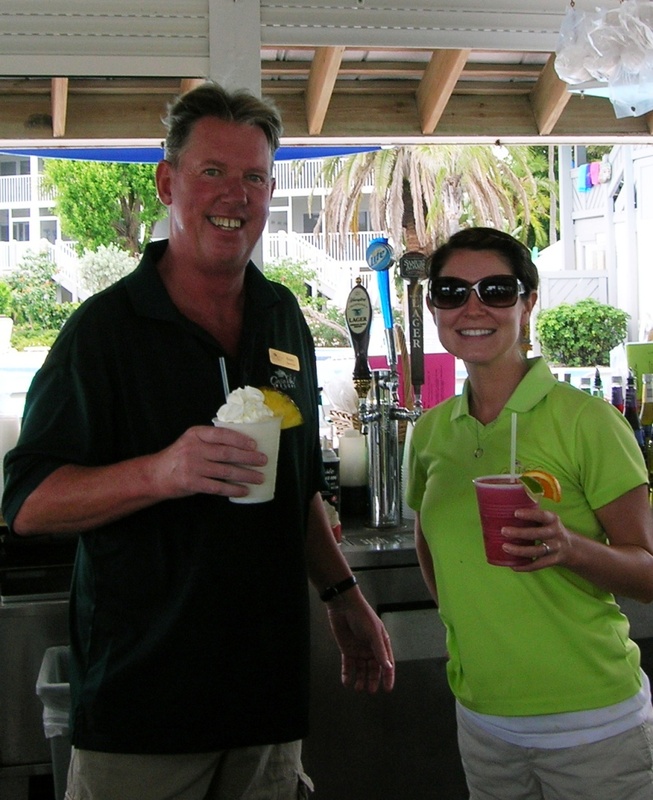 Since 2006, Lea O’Brien has co-supervised the Food & Beverage operations at Coconuts Poolside Bar and Grill and has been front and center to Casa Ybel Resort’s many annual visitors. Lea’s guest service ability and attention to detail make her an excellent candidate for the Event Coordinator position. She will work closely with Casa Ybel’s clients and staff to coordinate every aspect of an event to make sure it runs smoothly and successfully. Sean Ramsey who has been recently appointed Thistle Lodge Beachfront Restaurant Manager, is no stranger to Casa Ybel’s Food & Beverage Department. Having been one of its fine-dining servers since 2003 and later Dining Room Supervisor, Sean continues to share a wide-ranging understanding of food, wine and its preparation. 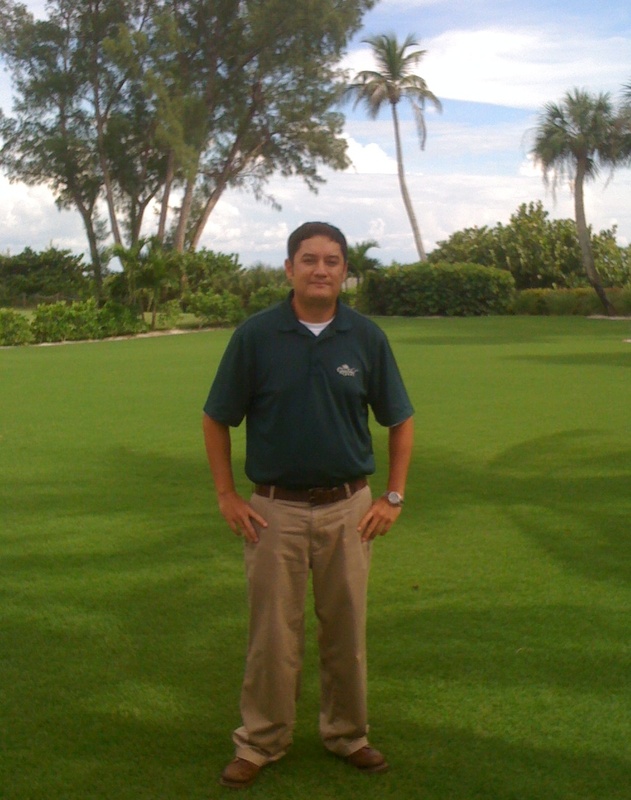 With his prior role in providing the premier Thistle Lodge experience and the help of fellow management team members, Sean will maintain Thistle Lodge Beachfront Restaurant’s reputation for Best Beachfront Dining on Sanibel Island. Both Sean and Lea will continue to work under the direction of Dennis Riley, Food & Beverage Director for Casa Ybel Resort. Categories: Casa Ybel Resort, Sanibel Island, Thistle Lodge, Uncategorized | Permalink. With each summer season on Sanibel Island there is growing anticipation for the moment the baby turtles hatch and crawl together to their ocean home by moonlight. The nesting begins in May and the hatching can continue into October. This year, along the Casa Ybel beach we were home to four different nests which each hold approximately one hundred eggs. They were each marked off to give caution and awareness to beach-goers until the hatching. Most of the baby turtles hatch from their eggs and with their combined movement and escape they are able to free themselves from the sand that is packed on top of them by their mother. Every morning during season, the Sanibel Captiva Conservation Foundation (or SCCF) volunteers go to each of the nests to inspect for activity. If any turtle tracks are observed, the nests are inspected and counted. If any baby hatchlings are left, they may need a little nudge and encouragement to make it out to sea. We were fortunate to have one of our nests hatch recently, and further, the opportunity to observe the volunteer inspect the nest to find that a few did need our help. As we cheered for the little turtles, we captured the exhausting experience of one little one to share with you. The pictures we snapped from this event, and being a part of nature excited our staff and guests, and helped to bring us all together on this island that cares so much about preservation. We can only hope that our little turtle returns some day to lay her own nest and continue that circle of life for us all. Categories: Casa Ybel Resort, Sanibel Island | Tags: Nesting, SCCF, Sea Turtle | Permalink. Lee County has miles of pristine shoreline and family friendly beaches, offering the kind of outdoor opportunities that thrill nature enthusiasts and casual sun catchers alike. By and large the beaches of Lee County offer the kind of family fun that attracts people from around the globe. Some come to Lee County’s wonderful beaches and stick a toe in the water, or grab some sea shells, glide along the surf on a skim board or just sit in a chair with their favorite beverage while the sun sets in a fiery majesty over the Gulf of Mexico. And relax, you’re on beach time now! There are likely no more famous and renowned beaches in Lee County than those of the barrier islands of Sanibel and Captiva. People travel thousands of miles just to comb the sugar white sands for legendary sea shells like the Junonia on Sanibel Island, where the shores have been protected from high rise condos and developments that plague the sands on much of the east coast. Residents and environmental enthusiasts have worked for years to keep those beaches – and the islands – protected, pushing hard make sure the island stayed as welcoming and pristine as it has for generations. Lighthouse Beach might be Sanibel’s most iconic beach, due largely to the lighthouse that sits on the island’s southern tip. Bowman’s Beach may be the island’s quietest beach. Situated toward Sanibel’s northern end, Bowman’s offers barbecue grills, outdoor showers and plenty of parking for families who want to enjoy the natural splendor. 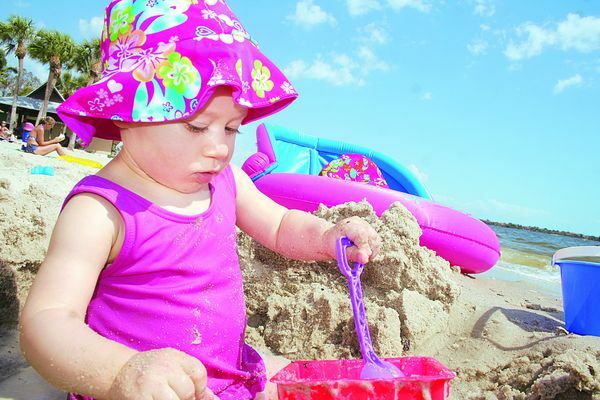 Sanibel also offers sandy fun at Tarpon Bay beach, located at the south end of Tarpon Bay Road. There is also ample, and free, parking along the causeway which leads to the island. Restroom facilities are also located along the causeway for family convenience. 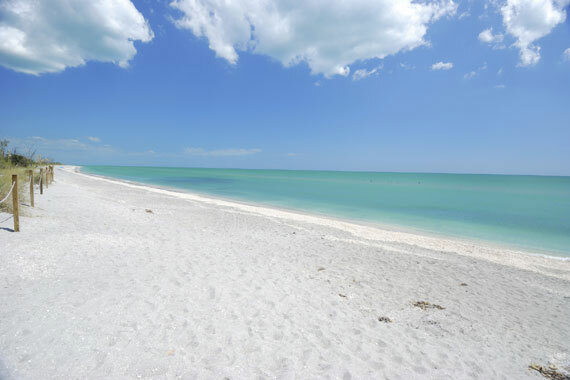 Captiva is even more exclusive than Sanibel, but the beaches are just as beautiful and pristine. Blind Pass Beach, or Turner Beach, offers a unique opportunity to visit both the Sanibel and Captiva side of the beach, as the two islands are separated by channel that was opened by a hurricane many years ago. Actually, locals struggle to keep that channel open from time to time, but sunworshippers, anglers and shellers alike are drawn to Blind Pass Beach to sample a truly tropical island experience. Further north, Captiva Beach has limited parking but views of the sunset are spectacular, as well as the beach’s location to Captiva’s shopping and dining center, as well as a library and the Chapel By The Sea, a historic and scenic church just a stone’s throw from the white powder of Captiva Beach. For more information visit sanibel-captiva.org. Categories: Casa Ybel Resort, Sanibel Island | Permalink. 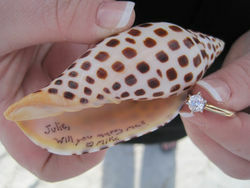 This junonia was "planted" on the beach by Michael Grey to propose to his fiancee Julia Dressler. The couple was married in April at Casa Ybel Resort surrounded by friends and family. On Jan. 15, 2010, The Sanibel-Captiva Islander contained a charming article about a young man from Pennsylvania who proposed marriage to his sweetheart by ‘planting’ a junonia on the beach with his “will you marry me?” message printed inside the shell. On April 9, Julia Dressler and Michael Grey made good on the promises from 15 months ago and tied the knot in style at Sanibel’s iconic Casa Ybel Resort. The bride was escorted to the 4 o’clock beach ceremony site by her parents, Suzanne and Barry Dressler of Jeffersonville, Pa., and Sanibel. Awaiting them were 75 guests who had assembled from as far away as Washington State and as near as Sanibel. As the bride approached, a spontaneous cheer went up from the guests, surprising all. Awaiting them was the groom, accompanied by his best man, Josh Weigner of Boston, and Julia’s Matron of Honor and cousin, Erin Intessimoni of Waterford, N.J.
Sanibel resident and owner of Weddings by the Sea, Patricia Slater, conducted the ceremony uniting the couple. The very personal insights of Slater’s service included the couple’s love of the island and of finding that special junonia discovered on the beach at Sanibel Moorings, where the bride’s parents have owned their home-away-from-home since 1985. The Matron of Honor proclaimed a reading from Sacred Scripture, the First Letter of John, in which God is acknowledged at the source of love. Mrs. Intessimoni also offered a Nuptial Blessing, on behalf of all those present, near the conclusion of the ceremony. The couple’s vows amused the gathering with their whimsical yet deeply-heart-felt commitment. The bride, a die-hard fan of the Philadelphia Phillies, promised that the groom would always be her MVP, that she would share their road trip of life together through many championship seasons. The groom, a collector of antique Jeeps, promised a life of love and excitement that would be as much fun as driving a rugged trail Jeep with no windshield, no doors or top! The couple obviously knows the value of a sense of humor within married life. Following the ceremony, guests enjoyed a cocktail party on the Great Lawn with butlers serving the couple’s signature drink, Sanibel Sunset, immediately upon arriving off the hot, sunny beach. Hors d’oeuvres were enjoyed, and tropical music by Clint Wiley delighted the guests until dinner was served under a magnificent tent. Chef John Wolff, of Thistle Lodge, served a delicious plated dinner featuring a duet of Filet Mignon with a red wine demi glaze and Florida Grouper with a key lime-infused butter sauce. The stunningly beautiful wedding cake, created by Mason’s Bakery, was a three-square-tiered tower of citrus fillings of key lime, lemon, and orange amid white cake topped by butter cream icing and white chocolate seas shells. The tables were adorned with aqua table linens, orange napkins, sand dollar place cards, and gorgeous tropical bromeliad centerpieces created by Sanibel resident and horticultural expert, Judy Hicks. The bride and groom and all the wedding-goers danced the night away to the energetic music of Clint Wiley’s None Other, six-piece rock band of state-wide renown. It was a gorgeous, starry night with Gulf breezes cooling the dancers. The band ended the festivities with Journey’s “Don’t Stop Believing” which brought down the house. 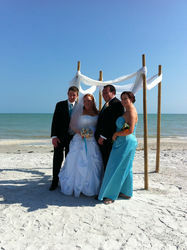 All of the images and memories of the day’s events were captured by highly respected Sanibel photographer, Nick Adams. It was a perfect day comprised of dozens of details all expertly overseen by Casa Ybel’s Wedding Coordinator, Jennifer Dube. After a “Morning after Mimosa Party” at the Dresslers’ home on Sunday morning and spending a relaxing day with friends and family, the couple departed on Monday for the docks at Fort Lauderdale. Awaiting the newlyweds was an 11-night cruise on Celebrity’s Equinox balcony state room and concierge class service to the countries of Mexico, Honduras, Costa Rica, Panama, Columbia, and Grand Cayman Islands. While there was no television reception of Phillies games, the couple did experience two shore excursions of Jeep-adventuring through the rain forests in Central America! On April 22, the couple flew north to take up residence in their new home in Skippack, Pennsylvania. But their hearts belong to Sanibel and it won’t be long until they return to the place they love best.